This webinar will discuss the why, when and how of collecting, evaluating and interpreting abuse potential data throughout CNS drug development, including a discussion of the design, analysis and interpretation of human abuse potential studies. The misuse and abuse of prescription drugs has received increasing media and regulatory attention in recent years. Companies developing new molecular entities (NMEs) with CNS activity or abuse-deterrent formulations (ADFs) of drugs with known abuse liability must submit all data relevant to the abuse potential of their drug. But what is meant by ‘potential for abuse’? What data must be submitted? When and how are these data collected? This webinar will provide insight into these questions by reviewing the methods involved in collecting abuse potential data during CNS drug development and current regulatory thinking on NMEs and ADFs. This will include an overview of nonclinical and clinical abuse potential data requirements throughout the CNS product development cycle and a discussion of draft FDA guidances for NMEs (2010) and ADFs (2013). The webinar will then focus on how human abuse potential studies are designed, including a discussion of the subjective and cognitive measures commonly included and related data collection systems. Analysis and interpretation of human abuse potential studies will be discussed, including challenges and limitations, and differences in approach between NMEs and ADFs. Viewers of the webinar will leave with a firm understanding of the what, when and how of abuse potential data collection, in order to meet increasingly stringent regulatory requirements for premarket evaluation of CNS products, and for ADFs, the potential for label claims. Kerri A. Schoedel, PhD, Director and Co-founder, Altreos Research Partners, Inc.
Dr. Schoedel has over 15 years of experience in addiction research, including extensive experience in clinical pharmacology, CNS drug development, and the assessment of abuse liability in preclinical and clinical studies, including the design and analysis of over 60 human abuse potential studies. Dr. Schoedel has contributed to over 100 research and review articles, book chapters, and national/international scientific presentations, primarily in abuse liability and CNS drug development. Dr. Schoedel completed her Ph.D. in Pharmacology at the University of Toronto, with a specialization in nicotine addiction. Dr. Schoedel joined INC Research (formerly Ventana/DecisionLine CRC and Kendle) in 2004 as a research scientist, was promoted to Scientific Director in 2008 and Sr. Director, Clinical Pharmacology in 2013. Dr. Schoedel led strategic planning and was responsible for study design and support for scientific projects, including clinical studies (human abuse potential, safety/tolerability, pharmacokinetics, thorough ECG, and neurocognition). Dr. Schoedel is a member of the College on Problems of Drug Dependence, and regularly organizes and participates in meetings with regulatory agencies to advance abuse liability methodology. Dr. Schoedel has also been involved in the preparation of numerous NDA and EMA drug abuse liability submissions, including those related to both NMEs and ADFs, and has interacted extensively with regulatory agencies. At Altreos Research Partners, Inc., Dr. Schoedel provides scientific and regulatory advice to Pharmaceutical and biotech companies, and leads the field in advancing abuse liability assessment. This webinar is designed for pharmaceutical and biotech research professionals involved in central nervous system (CNS) drug development, including scientists, program and project managers, directors, executives, and others involved in basic or clinical research in the CNS area. 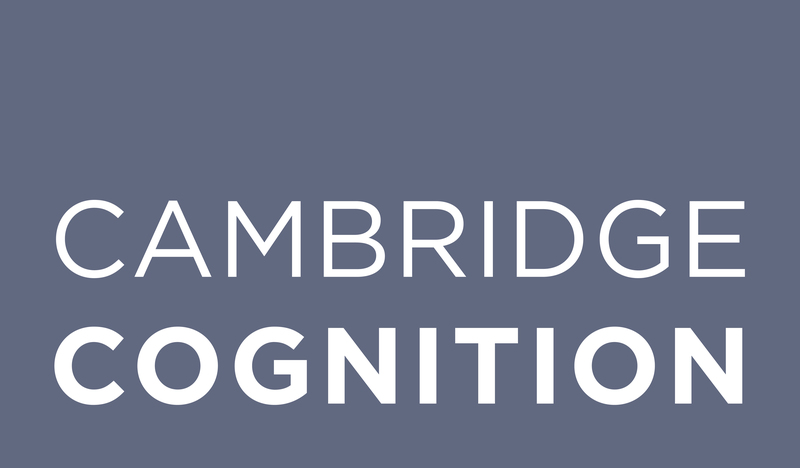 Cambridge Cognition is a leading global provider of computerized cognitive tests combining neuroscience and technology to optimize mental health through life. The company’s cognitive assessment technology, CANTAB™, is used to conduct sensitive language independent touchscreen tests in clinical trials, research studies and healthcare settings to advance understanding, diagnosis and treatment of cognitive impairments worldwide.